Josef Newgarden won his fourth race of the year Saturday night, making it three of the last four for the blonde American who somehow reminds us of a beach boy. He bested Scott Dixon by seven tenths of a second and was joined by peeved teammate Simon Pagenaud on the podium. Newkid’s late race pass around Pags for the lead was classic. The race began comically, with the increasingly dangerous Tony Kanaan spinning and crashing on the final parade lap. It was a weird vibe to start a race. After some repairs, he eventually finished many laps down in sixteenth, then refused to do an interview. That’s some fan favorite, huh? After the Kanaan debacle was cleaned up, the field had just taken the green flag when pole sitter Will Power spun and crashed into the turn 2 wall. Ed Carpenter and Takuma Sato were caught up in the melee, with Ed spectacularly going up and over Power’s car, their races ruined. Sato posted that he was “hit from behind” in a subsequent Tweet. Ed mentioned the slick track and Lights rubber being a factor, and looked forward to next season. “This year just did not go well,” the owner/driver admitted. 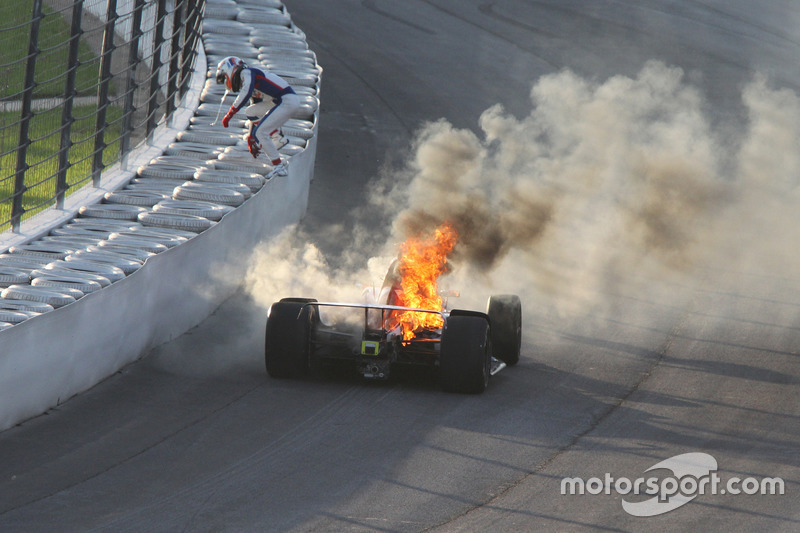 His employee J.R. Hildebrand later joined him in the pits after crashing out due to an apparent suspension failure. Power said “it was super slippery,” and that his teammate “Josef took my air” when passing. It’s “unfortunate,” the first to retire summed up, hinting at early dissension in the Penske ranks.